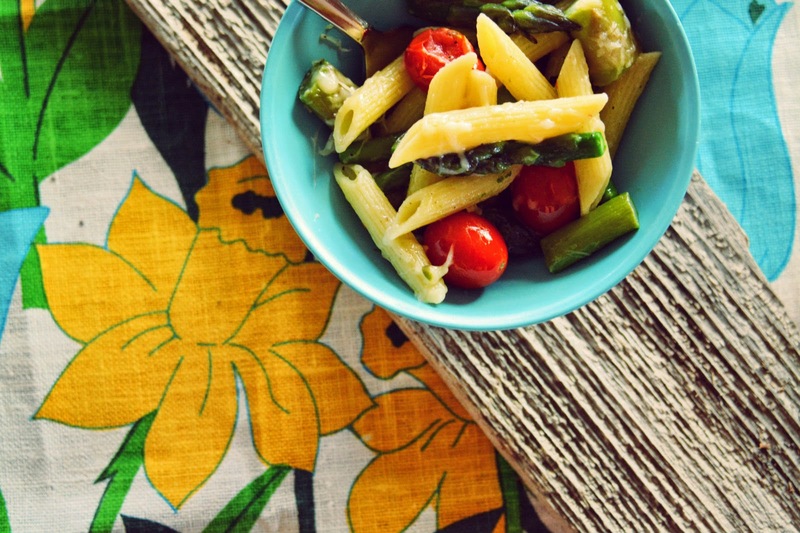 When your asparagus is growing like mold, Giada DeLaurentiis's penne with asparagus and cherry tomatoes is just the ticket. Bring a large pot of salted water to a boil. Add the pasta and cook until tender but still firm, stirring occasionally about 8 to 10 minutes. Drain the pasta, reserving about 1/2 cup of the pasta water. In a large saute pan, heat the oil over medium-high head. Add the garlic and cook until fragrant, about 1 minute. Add the asparagus. Season with salt and pepper, and cook for 3 minutes until slightly soft. Add the cherry tomatoes and peas. Cook for 2 minutes. Pour the chicken stock into the pan and bring the mixture to a simmer. Cook until the tomatoes start to burst and the stock is reduced by half, about 3 minutes. 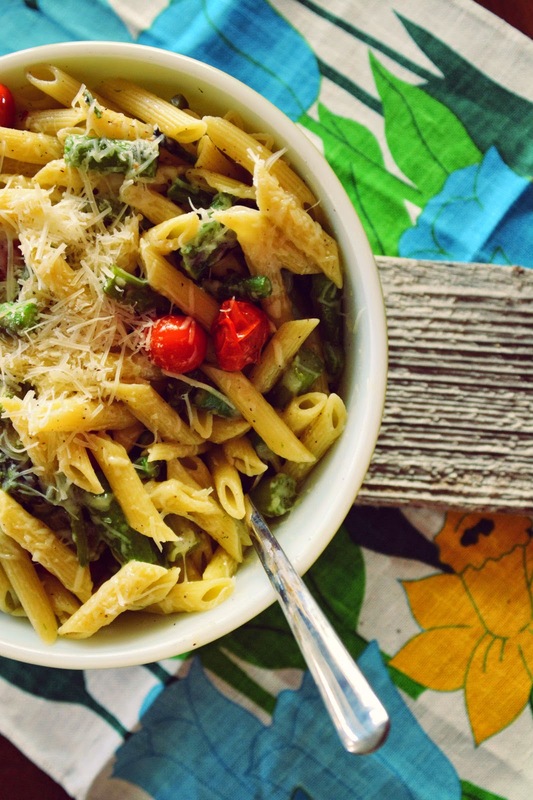 Transfer the asparagus mixture to a serving bowl. Add the pasta and 1/2 of the Parmesan. Toss well. Add the reserved pasta water, if needed, to loosen the pasta. Garnish with Parmesan and chopped fresh basil. I'm still jealous that your asparagus is growing like mold. I have to buy mine weekly at Costco. Thanks for the recipe.